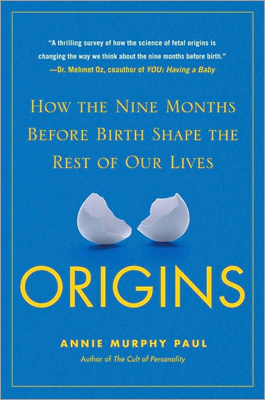 Annie Murphy Paul's new book, Origins: How the Nine Months Before Birth Shape the Rest of Our Lives, is getting the star treatment. It is the subject of a Time magazine cover story (written by Paul), and an article by the New York Times' Motherlode blogger, Lisa Belkin. And why not? Paul has written what looks to be a fascinating exploration of the explosion of research on the effects of the environment human beings encounter while developing in their mothers' wombs. 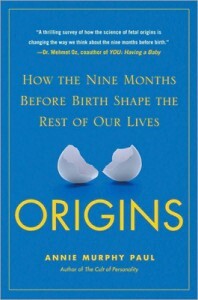 In a guest post for Motherlode (the link is above), Paul writes, "Startling as it may seem, qualities ranging from our intelligence to our temperament to our health, and our susceptibility to diseases as varied as cancer, asthma, obesity, diabetes and mental illness, are affected by our experiences as fetuses decades ago." We have already considered one aspect of this research here at Birth Story, how a mother's weight gain during pregnancy can influence her infant's lifetime chances of being able to maintain a healthy weight. But Paul covers the waterfront in this "new chapter in the long-running nature-nurture debate," as she calls it. In her Motherlode guest post, Paul raises and then downplays the likelihood that mothers will be blamed for anything that goes awry with their children, given the new understandings of the importance of what goes on in the womb. Love Paul's optimism! And, I'm impressed she researched this book while she was pregnant. I'm looking forward to reading it.